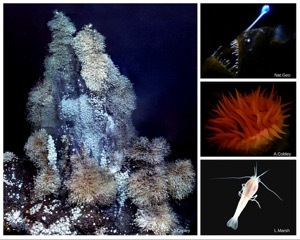 Biodiversity and environmental protection of deep-sea habitats targeted for mining. Deep-sea mining is a brand new industry that is potentially on the horizon for our global deep oceans, with test mining set to begin in 2017. Three different mineral resources are currently being explored for their potential to provide metals and rare earth elements currently exploited on land. These three mineral resources are found in three very different deep-sea landscapes which host communities of organisms that greatly differ from each other; abyssal plains, hydrothermal vents and seamounts. Because these resources are found both within and outside of State-owned waters, it is vital that State national and international UN laws, currently in preparation, take into consideration the great differences between these resources as habitats to diverse communities in order to create an industry that is environmentally sound and avoid serious adverse harm to our marine environment. In this talk, you will hear about deep-sea mining areas and the hidden communities living on them, who protects them and how science can help to advise environmental law protecting them. Speaker: Amber Cobley is a second year PhD Student with the Natural History Museum, London and the University of Southampton, supervised by Dr Adrian Glover, Dr Maria Baker and Dr Jon Copley. Amber’s current research focuses on how the new potential industry of deep-sea mining for metals and rare earth elements could affect biodiversity, and how national and international law can create a more environmentally sound exploitation of the deep sea. Previously, Amber completed her MSci Marine Biology at the University of Southampton, where she then moved on to work with the Deep Sea Conservation and Research Unit (@DeepSeaCRU) and Plymouth University under Dr. Kerry Howell. Her research focused on predictive habitat mapping of deep-sea biotopes to advise marine protected area management. Amber works on social media for the international Deep Sea Biology Society (@DSBSoc), works for both the Student Committee and the Events team at the Natural History Museum and is actively involved in the local volunteer marine group in her local town of Newquay, Cornwall (Newquay Marine Group). Visiting the NOC: As the NOC is located within the Port of Southampton and entry is via Dock Gate 4 Port Security require all visitors bring along with them their confirmation ticket and a valid form of photographic ID (Driving License / Passport). The Port of Southampton is the Strategic Authority for the implementation of security within the port area where the NOC is located. There are a number of designated visitor parking spaces available at NOC. If these are full after 5pm please drive to the staff car parks barriers and access can be given by pressing the intercom button in the box next to the barrier, on requesting entry you will be asked for Name and Car Registration number and the barrier will be lifted. Please do not park in areas not designated for parking and ensure roadways are kept clear. If you haven’t been to the Marine Life Talks before, subscribe to NOCMAIL to receive FREE email updates and alerts for future Marine Life Talks and other marine related topic. Marine Life Talks are held on the first Thursday of each month at 7.30pm in the Henry Charnock Lecture Theatre, National Oceanography Centre. Please sign in outside the lecture theatre on level four. All talks are free and open to members of the public.